Biden got it all wrong. The stock market crashed in 1929 and Hoover was President. Television was not in use in homes until the 1950's. FDR who was elected in 1932 talked to the nation by radio. Maybe Biden is not ready for the office of Vice President. Biden can get facts so wrong and no one blinks an eye. No columnist are calling for his resignation. Comics are not mocking him. What would be the response if Sarah Palin had said this? I was seduced by Sarah Palin. While I have followed events closely this political season, I was late developing any excitement for the upcoming election. For one thing, I have had a sense of defeat. With Bush’s low popularity and an unpopular war and bad economic news, I thought no matter whom the nominee was; this is going to be a Democratic year. It would almost take a miracle for any Republican to win, I reasoned. Also, I was simply disgruntled. I felt that the Republican Party had gone off track in many areas. I was disappointed about Bush leading us into an unnecessary avoidable war, was disappointed that Republicans had become the party of reckless spending, and was disgusted by the Jack Abramoff scandal. I have also been disappointed that many rank and file Republicans are still skeptical of global warming and have displayed a downright mean spiritedness regarding the immigration issue. I felt estranged from the Republican Party. I felt like the party was in a four way tug of war between the isolationist Paleo-conservatives, the Ron Paul Libertarians, the Neo-conservatives and the Holy Rollers and I did not feel at home in any camp. Nevertheless, I was still a Republican and did not see myself becoming a Democrat, but I could not get excited. Initially, I supported Fred Thompson for President, but he did not seem to have any fire in the belly and he did not generate a lot of excitement in me. I did send him a campaign contribution and put his ad on this website but could not get real excited about his candidacy. Following Thompson’s withdrawal, I supported McCain. There was not even a close second choice. I liked McCain’s support for immigration reform and his environmental record, two issues where I think the base of the party has simply got it wrong. I admired his integrity, his mainstream pragmatic conservatism, and his service to our country. Still, I could not get very excited. The Republican convention fired me up. I was anxious about how the Party could ignore a sitting President. I am so disappointed by the Presidency of George Bush that I was not in the mood to see thousands of cheering Bush fans. Thank God for Gustav! Watching the convention you may have not even known this was the convention of the Party of Bush and Cheney. The nomination of Sarah Palin excited me. Many pundits say Sarah excited the Party because she appealed to the social conservatives. I am pro-life and I oppose gay marriage so I guess that makes me a social conservative, but I do not feel comfortable with many on the religious right. The way I see it, these are the kind of people, who if elected locally, would want to keep wine out of the grocery stores and close all the strip clubs. They often come across as puritanical, self-righteousness, and intolerant and that makes me uncomfortable. Sarah Palin’s appeal to me was not because I was a dissatisfied social conservative. One reason Palin excited me was because she was “none of the above”. I liked her because she was not Lieberman, or Romney or Huckabee. Now, it is confession time: I am a sucker for an attractive woman. If you want to get me to support your cause or buy your product, send a pretty woman to talk to me. A pretty woman does not even have to be all that bright. Where I might challenge a man who says something that lacks logic, I let a pretty woman get by with it. I will let a pretty women waste my time, where I might cut a man off. A woman may talk rubbish but if she is pretty and a little flirty, I enjoy it. Call me sexist because I have different standards for men and women, but I’m a guy. I can be charmed and Sarah Palin is charming. I was seduced by Sarah Palin. Like a lot of relationships build on superficial attraction, after a time you began to see the flaws in the other person. I still like Sarah, but I am not as enamored. The more I have seen of her, the more I have come to doubt that she is that qualified to be President. I think she was mistreated by Charlie Gibson in the interview where he asked her the question about the Bush doctrine without clarifying his question. I felt that that was a trick “gotcha” question. (I hate to see a pretty little women mistreated.) In addition to the Gibson interview, I was outraged to see the mocking tone many used when speaking about her. I was angered by the long list of lies circulated about her such as the book banning charge. The claim that she wanted evolution taught in school was even repeated by a so-called responsible journalist. I defended her. Since the Gibson interview there have been other interviews where she did not perform that well. Unfortunately, Sarah Palin does not seem that knowledgeable about economics or foreign policy. Look at the videos at the bottom of this page. This is not terrible but she looks like someone who is in over her head. I keep watching, hoping she doen't say something stupid. She cannot make a coherent argument. She seems unsure of her reasoning. No doubt she will get better over time. And, if McCain is elected, hopefully he will remain in good health long enough for Sarah to get some on-the-job training. I know, some will think this is a sexist remark, but I think it is reality: If you have been busy having and raising five kids, you probably have not had a lot of time to read important books, read good newspapers, do Internet research or watch C-Span. With kids to go to Hockey practice and needing help with the homework and needing fed and changed and comforted when they skin a knee, Palin may not have had the time to sit at her computer and educate herself about the crisis in Darfur. She may not have had time to reflect on the issues of the day. True, I would not make the same assumptions about a male politician with five kids, but fathering is different than mothering. In addition to her apparent lack of knowledge and inability to answer a question coherently, the unanswered questions about whether or not she used undue influence to settle a family feud with her brother-in-law and her acceptance of over $25,000 in gift from those seeking state favors during her 20 months as governor have tarnished her image. No doubt Sarah Palin made a good small town mayor. She might be a good governor of a sparsely populated state. I would love to sit next to her at a Hockey game. I am not sure she is ready to be President. Given the choices we face, I am still certainly voting for McCain-Palin but the romance with Sarah Palin is almost over. This does not look good. This does not look good at all. This is depressing news. Maybe there was full disclosure and it is all perfectly legal, but for someone who bills herself as a reformer, she should be above reproach. Accepting gifts from someone seeking favors from the state certainly does not pass the smell test. I don't have too much of a problem with a lobbist buying a poltician a meal, but a $1200 gold nugget pin is a little much. Unless there is a very good rational why this was not a conflict of interest, this could be very damaging to the McCain campaign. I just now discovered this news item and it was published on Friday. I am surprised it has not made a bigger news splash. There was nothing in our local paper about it and I have not heard it mentioned on any news program. So, maybe it is not such a big deal. I hope that this does not derail the campaign but part of the appeal of the McCain-Palin ticket is that they are reformers and will change the culture of Washington. I want to really believe that. Even if there is no political fallout from this, I still find it disappointing. Call me naive, but I would like to think that there really are honest public servants who have high ethical standards. With Obama's long time connection and financial dealings with the Chicago slum lord and shady character Antoin "Tony'' Rezko, the Obama campaign is probably reluctant to start comparing ethical records. Nevertheless, this is disappointing. I would like to hear an explanation. It is with reluctance that I conclude Congress must past the amended version of the Palson Plan. I would prefer the House Republican Plan, if I thought it would work. Unfortunately, from what I have read, I don't think the House Plan would be sufficient, and the stakes are too high to gamble. I hate the thought of the federal government taking on a $700 billion dollar obligation and buying all of the bad mortgage loans that should never have been made in the first place; however, I think it is necessary. I know some free market purists are advocating letting the companies that made these bad loans and the investors that purchased this bad debt fail and let the chips fall where they may. I understand the argument. I understand the dogma. Now is the time, however, for pragmatic solutions that will get us out of this crisis. It is great to have guiding principles, but you shouldn’t let them guide you over a cliff. I also understand those who don’t like the idea of bailing out rich, fat cats while letting homeowners get foreclosed and neglecting other unmet needs. Yesterday I was in a chat group and someone wrote, “Isn't it funny how they can find $700 billion for this, yet they can't come up with enough money to get us health insurance? Man, I wish I was rich enough to get bailed out by the government when I couldn't pay my bills.” I understand the sentiment, but resentment is no substitute for sound policy. There is a record shortage of credit in our nation's economy and the situation is growing worse by the day. If the credit markets continue to deteriorate, and credit provided by our country's banks and lenders is no longer available, businesses will no longer be able to secure short-term loans, forcing them to lay off workers because they can't meet payroll. It will become impossible for individuals to secure car loans or mortgages — leading to more foreclosures, pressure on housing prices, and a worsening of the credit crunch. In a worst-case scenario, credit cards may no longer function and the ability to even cash a paycheck may no longer exist. This is how a financial crisis becomes an economic calamity that will have an effect on every American and Tennessean. I am appalled that Democrats have tried to use this crisis as a means of permanently funding the liberal activist organization ACORN. I assume there are enough pragmatic Democrats who will put country above party and that provision will be stripped from the bill. I would not support the bailout if the ACORN provision is in it, and unless the taxpayer protections, as stated in Lamar Alexander’s article below, are included. If those changes are in the final version, then I think the plan should be adopted. If I were in Congress, based on what I know now, I would have to hold my nose and vote for the bailout. This is an excellent article by Tennessee's Senior Senator Lamar Alexander. He answers in simple terms: "What's the problem? ", "What's causing the credit freeze? ", "How will the Paulson Plan help? ", and "How can taxpayer be protected?" I am not going to pretend that I fully understand all of the causes of the current financial crisis. Quite frankly, after listening to hour upon hour of pundits discuss the crisis and reading numerous articles, I am not sure anyone fully understands it. No doubt there were multiple contributing factors. A lot of supposedly smart people had to do some stupid things to allow this mess to develop. The left is painting this crisis as a failure of free enterprise and blaming Wall Street greed and deregulation. No doubt greed and regulatory failures were contributing factors, but we should not overlook the governments responsibility in this mess by pressuring lenders to make "affordable" mortgages available to unqualified borrowers. The Community Reinvestment Act pressured lenders to make risky loans that should never have been made. Government has had a policy of assuming that a lower homeownership rate among minorities was a result of discriminatory lending practices rather than a result of economic reality. An interesting fact brought out in this video is that the liberal Democrats were the largest receipt of Fannie Mae campaign contributions. Chris Dodd, followed by Barack Omaba were the largest recipients of these contributions. When it comes to assessing blame for the current crisis, Democrats do not have clean hands. This video is the best thing I have seen on the current crisis. At ten minutes, this is a little long but it is well worth watching. This video is fast-paced. I would suggest you use the pause button to take a good look at some of the charts and graphics. I discovered this video posted on Blue Collar Muse. This needs to be seen by everyone wanting an understanding of the current crisis. If you are a blogger or belong to chat groups, please repost it. No need to post a link back, just repost it. Dear Mr. Obama: Who Are You? "Watching Barack Obama over the last two years has left me absolutely stymied over who he is or what he believes. If you try to be everything, you don't stand for anything." This video questions who is the real Obama. It is amazing the number of "clarifications" and flip-flops Omaba has been able to do and yet hang on to his supporters. I like the Obama that says he would get out of Iraq responsibly better than I liked the Obama who was calling for an immediate withdrawal and who opposed the surge. The current Obama seems like a much more reasonable, sensible, cautious, moderate guy than that Obama who was running against Hillary Clinton. That other Obama seemed a lot closer to Bill Richardson or Dennis Kucinish than the new Obama. The thing that amasses me is that Omaba can move this fast and this far toward the center without the left feeling betrayed. Is it all personality, a promise of change, celebrity, and charisma or is their any substance to Obama? He has no record or experience. He has not sponsored any significant legislation. He votes dependably liberal but has not taken the leadership on any issues. He has not championed any cause. What will we get if the country elects Senator Obama President? I really don't know if he will be a champion of liberal causes or govern from the center as a competent do-nothing administrator, or perhaps an incompetent do-nothing administrator. Maybe we will learn more in the debates, but for now I can not help but wonder if he is just an empty suit with no convictions. Of course from my prospective, if he is elected, I hope he is a competent administrator with no passionate convictions. With no record and a press that treats him with respectful deference it is hard to know who he really is. He is hard to pin down. Dare I say that electing Obama would be like buying a pig in a poke? Like William F. Buckley, Barack Obama, Bill Clinton, Sarah Palin and tens of millions of other Americans, I have "tried" marijuana. Unlike Bill Clinton, I did inhale. Unlike Sarah Palin, I did enjoy it. The War on Drugs has been a failure. I think ending the prohibition against marijuana would be a good place to start in changing our drug policy. Marijuana is a harmless drug. It is absolutely ridiculous that society continues to ruin lives and waste millions of dollars arresting and jailing people for engaging in such a harmless activity. If we had more marijuana and less alcohol the world would be a better place. Maybe, if marijuana was legal, more people would choose to get high rather than drunk. The worst thing you can say about marijuana is that it makes people have a stupid grin on their face and think that Oreo cookies are the best thing they ever tasted. People stoned on marijuana are not prone to domestic violence or barroom brawls. Stoned people find life amusing and, by and large, are easygoing and peaceful. Marijuana may be a net plus for society. It time to end the asinine policy of pot prohibition. It is time to end the hypocrisy. Millions of Americans routinely engage in the harmless activity of smoking pot but yet have to lie about it. If they don't lie about it they may get arrested, or lose their job, or lose visitation rights or custody of their kids. I suspect that a lot of people who hold important jobs and are accomplished and responsible people routinely smoke a little dope. But, they cannot say, "yeah, I like to get stoned every once in a while." They may say that in their youth they "tried" the drug, but they do not admit to currently using it. Making millions of people be liars and hypocrites is the least of the things wrong with our drug policy. People really do get a police record or go to jail or lose their jobs or lose child visitation rights because of using marijuana. Millions and millions of dollars are spend on law enforcement to prohibit people from engaging in a victim-less crime. Police resources are wasted on enforcing pot prohibition rather than concentrating on real crimes. I also suspect that the prohibition against marijuana weakens the ability to control other really harmful drugs. If you tell a young person that marijuana is harmful and then they discover you lied to them, why should they believe you when you tell them that crack is harmful? Possession of small quantities of marijuana should not be a crime. Dealers should be licensed and taxed. Marijuana should be treated like tobacco or alcohol. More harmful drugs should be treated primarily as a health concern rather than a law enforcement issue. We should spend more on honest drug education and treatment and less on punishing the user. We should end the war on drugs and admit that drugs won. I am not supporting Bob Barr for President, but I am pleased to see he is talking common sense about our irrational counterproductive War on Drugs. LOL! This is very very funny. I know Democrats may enjoy it more than Republicans, but you have got to admit this is funny without being mean-spirited. Don't loose your sense of humor. Enjoy! This young lady is Sara Benincasa and this is the first of a series of video clips spoofing Sarah Palin. This is the only one I have watched so far but look forward to seeing more. Did William Ayers Launch Obama's Political Career? I was hesitant to post this video. Anybody can post a video on Youtube; that doesn’t make it true. I do not want to be guilty of character assignations or spreading smear attacks. I don’t know the truth of these allegations. Maybe, Ayers was just “a guy in the neighborhood.” Maybe Obama does “know thousands of people” and Ayers is just one of the people he knows. Did Ayers give Obama the job as Director of the Annenberg Challenge? Did Ayers launch Obama’s political career? How close are Ayers and Obama? I don’t know. However, these charges are so serious and there seems to be sufficient evidence to support the charges that I would like to see some responsible journalist investigate the charges and either confirm or refute them. To be fair, candidates raise lots of money from lots of sources. Does taking money from a disreputable person taint you? People may support a candidate; that does not mean the candidate supports those people. You may sit on a board of an organization with a disreputable, despicable person and that does not make you friends with them. There is an old adage that says, “you are known by the company you keep.” How much truth is in that? How close of a relationship do you have to have with someone before it should be an issue? If a Republican candidate for President had had his career launched by an unrepentant former founder of a White supremacist militia-type organization that had committed acts of terror, but who is now a successful respected businessman, would that and should that be an issue in that candidates fitness for office? Ayers was the founder of one of the most violent terrorist organizations in America’s history. The Weather Underground declared war on the United States, urged kids to kill their parents, bombed buildings and killed people, robbed banks, and committed other terrorist acts. Ayers is unrepentant. He says they did not bomb enough. We know Ayers and Obama had some sort of relationship. Before Obama is elected President, I would like to know the nature of that relationship. I think the public has a right to know. It is always great to get complements and awards. Thanks to Political Rants from the Right for awarding me the Brilliante Weblog Premior 2008 Award. 1. The award may be displayed on a winner’s blog. 2. Add a link to the person who you received the award from. 4. Then add their links to your blog. 5. Add a message to each person that you have passed the award on to in the comments section of their blog. Blanca Debree Blog. This blogger is witty, irreverent, maddening and clever. Matt-Speak. An insightful blog from a common sense conservative. Regarding Liberty, “fiscally nuts, socially insane” This teen blogger is a common sense, moderate conservative, sharp, insightful ,and smart, wise beyond his years. Hillbilly Savants, “This blog is about our Appalachia - the real one, not the Hollywood-stereotype nor the third-world nation-esque stereotype being sold by do-gooders, or even the neo-Romantic sylvan stereotype that Rousseau would probably buy into.” This is the non-political blog I am passing the award on to. I do have interest other than politics. Being originally from east Tennessee, I love this blog. It has lots of photos of the beauty of the area and covers history, current events, music and art. Don't Spread Lies Like the "Obama's 50 Lies"
If you visit lots of chat groups and blogs like I do, you have probably come across the widely circulated list of "Obama's 50 lies." With this being the season of extreme partisanship, it is easy to believe the worst about your opponent. I researched the list to see if it was something I wanted to repost. I discovered the list is simply not true. In some cases, the person who compiled the list claims Obama said things that there is no record of him ever saying. In other cases, what is claimed to be a lie is in fact true. In some cases the items on the list may be open to alternative interpretations of events, or be opinions, or simply harmless slight exaggerations. "Father was a goat herder- Liar, he was a privileged, well educated youth, who went on to work with the Kenyan Government." Snopes points out that these attributes are not mutually exclusive and Obama's father was all three of these things at one time. Obama's biography states the his father was the son of a prominent farmer and an elder in his tribe and as a youth he herded goats. But it also says that he won a scholarship to study in Nairobi and then he was selected to attend a university in America. There is nothing to this supposed lie. Please save these as a "favorites" and use them to verify before you pass along a rumor. I certainly do not want to see Barack Obama elected President, but the truth matters. I think Obama's relationship with 60's radical William Ayers and his radical pastor Jeremiah Wright should be exposed. There is enough to expose about Obama without making stuff up. Just as the left has spread vicious lies about Sarah Palin and her banning of books and other non-sense, some on our side of the political divide have been guilty of spreading lies about Obama. Unfortunately, it seems there have been more liars on our side than on the other side. Both group of liars are to be condemned. Please before you pass on something you get in an email or read in a chat group, check it out. All is not fair in love and war and politics; the truth is important. How does it feel to "win"? How does your family feel about your “winning,” breaking a glass ceiling? What did you think of your Clinton's speech? Below are the questions Charlie Gibson asked Sarah Palin. Do you have enough qualifications for the job you’re seeking? Specifically have you visited foreign countries and met foreign leaders? Questions about foreign policy: territorial integrity of Georgia, allowing Georgia and Ukraine to be members of NATO, NATO treaty, Iranian nuclear threat, what to do if Israel attacks Iran, Al Qaeda motivations, the Bush Doctrine, attacking terrorists harbored by Pakistan. Is America fighting a holy war? Other than the way in which Gibson asked the "Bush Doctrine" question to make it appear Palin did not know what it was, when in fact there is no single definition of the Bush Doctrine, I do not think the interview was improper or unfair. I want candidates to be asked hard questions. What I object to is the uneven treatment. The Democrats get asked the easy questions and are allowed to weasel out of an answer while the Republicans are nailed to the wall. It is my observation that this is generally true of most main stream journalist. They find it difficult to be objective. The late Tim Russert, I thought, was an exception and was fair and even handed despite being liberal. Most journalist miserably fail in hiding their liberal bias. Disclaimer: While I would like to take credit for it, this post is not a result of original research. I first came across this information on a couple different chat groups and then traced it to three different blogs. I have read the above transcripts and the lists of questions are accurate. I have included the links to those interviews if you would like to read them for yourself. 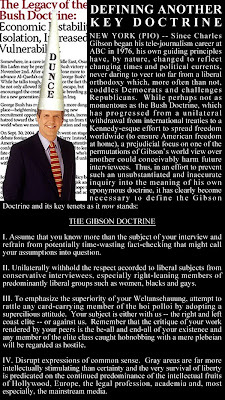 I formulated the Gibson Doctrine based on my observations. What Exactly Is the 'Bush Doctrine'? It's being taken in some quarters as revelatory of inexperience that Sarah Palin sought clarification when ABC's Charlie Gibson asked her about the Bush Doctrine. To review, here is the passage from the transcript. Gibson should of course have said in the first place what he understood the Bush Doctrine to be--and specified that he was asking a question about preemption. Palin was well within bounds to have asked him to be more specific. Because, as it happens, the doctrine has no universally acknowledged single meaning. Gibson himself in the past has defined the Bush Doctrine to mean "a promise that all terrorist organizations with global reach will be found, stopped and defeated"--which is remarkably close to Palin's own answer. September 20, 2001 PETER JENNINGS: . . . Claire, the president said at one point, 'From this day forward, any nation that continues to harbor or support terrorism will be regarded by the United States as a hostile regime.' Should we be taking that as the Bush doctrine? There is no single definition of the "Bush Doctrine." In the Weekly Standard article the author goes on to quote a total of eight different definitions of the Bush Doctrine including two different definitions from Charlie Gibson himself. All of these are from ABC news sources and include, in addition to Peters and Gibson, definitions by George Will, George Stephnopoulos, Terry Moran, and Bob Woodward. Palin did not show herself uninformed; Gibson showed himself to be a biased, condescending, arrogant, elitist snob with an agenda. He owes her an apology. So, Sarah Palin blew it when Charlie Gibson asked her whether she supported the so- called “Bush Doctrine.” She momentarily halted before asking, “In what respect?” Charlie Gibson could have clarifying his question. I wonder if he would have been more helpful if the interviewee would have been Barack Obama or any Democrat. Palin answered the questions by saying, "I believe that what President Bush has attempted to do is rid this world of Islamic extremism, terrorists who are hell-bent in destroying our nation. There have been blunders along the way, though. There have been mistakes made, and with new leadership, and that's the beauty of American elections, of course, and democracy, is with new leadership comes opportunity to do things better." I thought that was a pretty good answer. Apparently however, that was not an acceptable answer to the question that was asked. She apparently didn’t know that the Bush Doctrine is that the US has the right to presumptively attack a country that is believed to be a threat to the US. I stay pretty informed and am a news junkie. I could not have given a succinct one-sentence definition of the Bush Doctrine prior to this interview. I am not so sure that very many people could do so. The Bush Doctrine is a term used to describe various related foreign policy principles of United States president George W. Bush, enunciated in the wake of the September 11, 2001 attacks. The phrase initially described the policy that the United States had the right to treat countries that harbor or give aid to terrorist groups as terrorists themselves, which was used to justify the invasion of Afghanistan. Later it came to include additional elements, including the controversial policy of preventive war, which held that the United States should depose foreign regimes that represented a supposed threat to the security of the United States, even if that threat was not immediate (used to justify the invasion of Iraq), a policy of supporting democracy around the world, especially in the Middle East, as a strategy for combating the spread of terrorism, and a willingness to pursue U.S. military interests in a unilateral way. Some of these policies were codified in a National Security Council text entitled the National Security Strategy of the United States published on September 20, 2002. This represented a dramatic shift from the United States's Cold War policies of deterrence and containment, under the Truman Doctrine, and a departure from post-Cold War philosophies such as the Powell Doctrine and the Clinton Doctrine. The first usage of the term to refer to the policies of George W. Bush may have been when conservative commentator Charles Krauthammer used the term in February 2001 to refer to the president's unilateral approach to national missile defense. The main elements of the Bush Doctrine were delineated in a National Security Council document, National Security Strategy of the United States, published on September 20, 2002, and this document is often cited as the definitive statement of the doctrine. The National Security Strategy was updated in 2006. Ok, class, a pop quiz: Compare and contrast the Bush Doctrine, the Powell Doctrine, the Clinton Doctrine, the Reagan Doctrine and the Carter Doctrine giving the strengths and weaknesses and criticisms of each. If you get an “A” you are qualified to be Vice President. This is more good news! Yesterday it was the poll numbers, today this news. The momentum is with McCain. Now that we are into the general election the McCain campaign will reap an infusion of $84 million in public financing. Obama had had such success with early fund raising that he decided he would do better without public funding. Now, it seems, that the money is not flowing into the Obama campaign the way it was anticipated. For one thing, the Hillary supporters are not supporting the Obama campaign to the degree it was expected. Not that the Obama campaign is broke; far from it. In fact, following the Palin nomination speech, the other side was so outraged that they opened their wallets and gave Obama a one day spike in contributions breaking previous records. Palin's speech may have resulting in more funds flowing to Obama than McCain. Despite this one day fund raising record however, the overall level of contributions to the Obama campaign is down. Nevertheless, Obama has out raised and out spent McCain considerably. I feel the momentum is with our side. 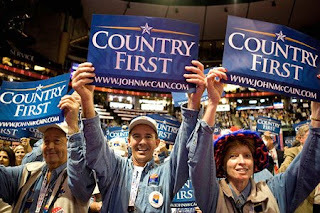 The enthusiasm is with McCain-Palin. Obama does not appear near as cocky as previously. The mainstream media is still fawning over Obama and the smear campaign against Palin is in full gear, but it seems the momentum has shifted. The McCain campaign in on the ascendancy and Obama is sinking. We need to keep the momentum going as we go into the debates. It would be ashamed to loose this election due to a lack of money. Please give, give, give. Click the McCain ad to the left and it will take you to the McCain website where you can conveniently contribute using any major credit card. The following is reproduced from Fact Check. Wasilla library. Some of the books on a widely circulated list were not even in print at the time. The librarian has said Palin asked a "What if?" question, but the librarian continued in her job through most of Palin's first term. for president. She once wore a Buchanan button as a "courtesy" when he visited Wasilla, but shortly afterward she was appointed to co-chair of the campaign of Steve Forbes in the state. Alaska's schools. She has said that students should be allowed to "debate both sides" of the evolution question, but she also said creationism "doesn't have to be part of the curriculum." to discredit Palin, I am also sure than many well-intentioned people are repeating these lies simply because they are naive and gullible. Fact Check is a project of the Annenberg Public Policy Center of the University of Pennsylvania. They appear unbiased and objective. Fact check gives detailed analysis of each of the Palin smears. To see the Fact Check article, click here: Slimming Palin. Fantastic! Unbelieveable! For the first time, McCain pulls ahead in all the polls. We may just win this thing. A few weeks ago almost everyone thought Obama had it wrapped up. I was for McCain and had contributed to the campaign, but if I was placing a bet, I would have bet on Obama. Now it looks like it may be a real contest. If you have not contributed to the campaign, please do so. Click the McCain ad to the left and it will take you to the McCain site. You can pay with Mastercard, Visa, Discover, or American Express. It is quick and easy. Also, you can order a McCain yard sign and bumper sticker for only $7. Show your support! This is another element is the smear campaign against Sarah Palin. This lie is making the rounds of left wing chat groups and apparently has been picked up and circulated by email far and wide. There are also some Harry Potter books listed that had not even been published yet at the time she was major of Wasilla. The entire list of books is similar to a list of books that someone at sometime, somewhere has tried to have removed from library shelves or reading list. As best as I can tell, here is the basis of this lie. Eight years ago the Wasilla library was considering a change in its book challenge policy. Apparently many library systems have a policy in place for dealing with challenges to their book selections. Sometimes citizens complain about the book selections in their library simply because they may want more children's books and fewer romance novels. At other times citizens may oppose a book selection because they find a book offensive for one reason or another. To read more about what is behind this element of the campaign of misinformation, see the following: 'Creation science' enters the race. If you missed the McCain acceptance speech or simply want to enjoy it again, here it is. There’s a savage narrative developing among the media’s elite that suggests Alaskan Governor Sarah Palin will be a bad mother if she becomes the nation’s first female vice president. MSNBC, CNN and the Washington Post have each hinted Palin may neglect her five children, including one with Down’s Syndrome should the Republicans win the White House in November. Democratic vice presidential candidate Joe Biden even spent a considerable amount of time opining about Palin’s looks while attempting to lay out the differences between himself and Palin. Commentary: Feminism is not about advancing the cause of women but about advancing a left-wing agenda. Feminist never honor conservative women of achievement. Margaret Thatcher, Condoleezza Rice, Elizabeth Dole, or Sarah Palin cannot be considered feminist by the political feminist establishment, not because they are not women of achievement but because they are conservatives. It is much the same with the Civil Rights establishment: Michael Steele, J. C. Watts, Clarence Thomas and Colin Powell will never be honored by the Black establishment. Identity politics is not about righting wrongs or uplifting people but about advancing an agenda. Feminist activist are not above using sexism to advance their true agenda. Can a Female Feminist be a Male Chauvinist Pig? A Great Convention! A Great Speech! I just finished watching the convention and think the Party struck just the right note. I thought Lieberman did a good job and was glad he had a role. Fred Thompson was good. I would still like to see him become President. I thought Governor Palin was great! I thought John McCain gave a great speech! I know he is not known as a great orator, but the rising crescendo of oratory at the end had me wanting to cheer and applaud. I was impressed and inspired. More impressive than the building emotionalism of the speech however was the perception of John McCain as a decent, honorable, man who has served his country with honor and distinction. He is someone I trust to do the right thing. I think he is wise and good and will put country first. I think our country has been headed in the wrong direction and feel John McCain will put us back on the right track. We need change and reform, but not the statist solutions offered by the Democrats. We need a return to principled conservative governance but we also need pragmatism and someone who is committed to changing the partisan climate of Washington. I just now made my second contribution of this campaign season to the McCain campaign and sent $100. Not a lot, I know. If you have done more, shame me into another contribution. Please, if you want to see John McCain elected president, make a contribution. If you can’t afford $100 make a contribution of $50 or $25. If you have the means to make a larger contribution, please do so. Obama’s supporters have put their money where their mouth is. Do they care about the future direction of this country more than we do? We need to flood the campaign with money. If you, like me, watched this convention and felt that it is important that John McCain be the next President of the United States, open your wallet. Do it now, while you are still motivated. You can safely and easily make a campaign contribution using Visa, MasterCard, Discover or American Express. Just click on this link: John McCain. It will take you to the John McCain campaign site, then click on the “Invest in Victory” button. I know Obama is leading in the polls. It is going to be an uphill battle do win this election, but I feel energized and feel more passion for a Republican victory than I have in a long time. November the second is still a long way off. A lot can happen between now and then. I believe McCain can win! Child Reflects Poorly on VP Candidate. Was Candidate Properly Vetted? Comment: It seems Joe Biden is not the man of the people with working-class roots after all. His family was solid middle class. His father was an excutive, a co-owner of a business and a manager. Politicians of both parties routinely extol the virtues of “hard working Americans.” Who are they talking about? These are peoples who I think deserve the title of “hard working Americans:” People who rake hot asphalt in the summertime, people who freeze in the winter while they're out repairing busted pipes, people who pick lettuce, people who pour concrete all day long in the sun, people who pluck chickens, waitresses who must stand on their feet all day and work long hours and put up with demanding bitchy customers. To my way of thinking, it is not just physical labor that makes you a “hard working American” however. Some white-collar jobs and people with professional jobs also qualify. If you have a high-stress job, that may qualify you. If you are an attorney with a heavy caseload and you are practicing family law or criminal law then you are a “ hard working American”. If you own you own business and have to struggle to meet payroll and you work a lot of hours, you are a “hard working American”. If you are working in the emergency room of a hospital you are a “hard working American.” I guess I also think of anyone who is working more than one job or working more than 50 hours a week as a hard working American. Americans certainly work more hours than other advanced industrial nation. In a typical year, Americans work the equivalent of a week more than the Japanese, three weeks more than the British, six weeks more than the French and nine weeks more than the Germans. And, more of us work. The unemployment rate in America is only 4.6% and it is 8.3% in France and 8.4% in Germany and in lots of third world counties they have unemployment rates in the 40% range. By the world’s standards we are hard working. You often hear Americans complain about how hard they must work. Sometimes people will say that if takes both husband and wife working to support a household whereas when they were children, one wage earner could support a household. This is only true because we want so much more stuff, like bigger houses and newer and more cars and toys. A family of five in the fifties could live in a 3-bedroom house with one bath and drive only one used sedan and have no cable TV or cell phones and not feel poor. A family living in those conditions today would think of themselves as deprived. It does take more income to support the lifestyle we expect, but we expect a lot more. We work more because we value money and the thinks it can buy more than we value leisure time and other things.